After the Council photo shoot last Friday outside the Astoria in which I posed with Matt’s pretend palette and brush, here is the press release, keep an eye out for City News sometime soon! Photo by Hannah Brackenbury. 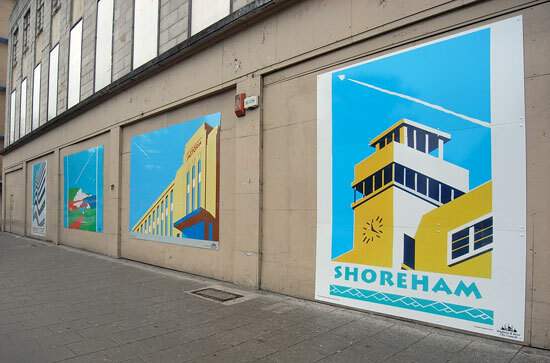 Brighton & Hove City Council has installed Art Deco paintings, commissioned from a local artist, on the former Astoria cinema site in Brighton to brighten up the unused site. 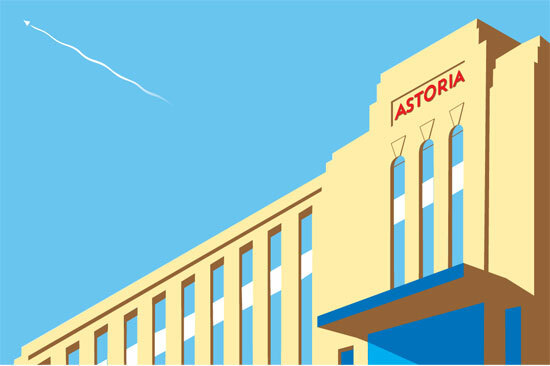 The paintings feature local landmarks in the retro-style of 1930s posters and include an image of the Astoria cinema, specially drawn for this display. Other images on the building include Shoreham Airport, Embassy Court and the Seven Sisters. Councillor Dee Simson, Brighton & Hove’s cabinet member for community affairs, said: These gorgeous paintings really brighten up the place whilst also linking back to the building’s heyday in the thirties. Not only does the building look better, it’s well known that looking after your local environment makes residents feel safer and more secure. 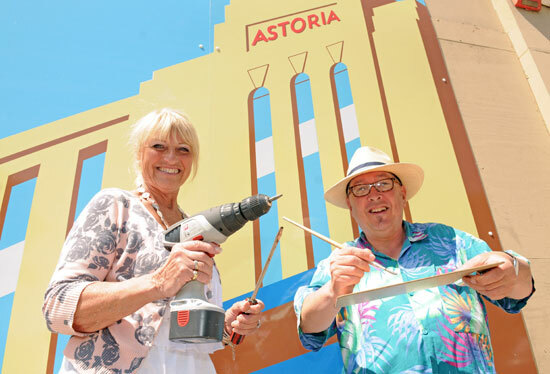 Artist Fred Pipes said: I was very flattered when the council asked me to help with this project, particularly as the paintings fit so well with the Astoria’s history. There are lots of great examples of Art Deco design and architecture around this area and I jumped at the chance to include the cinema in the collection. The city council’s environment improvements team works across the city to reduce the number of unsightly buildings and has recently spruced up Preston Street and the former Charter hotel in the city centre and Upper Bedford Street in Kemptown. Today was the drizzly day that Tony from Doubledot and his gang installed my four big pictures outside the derelict Astoria cinema, replacing the photos. 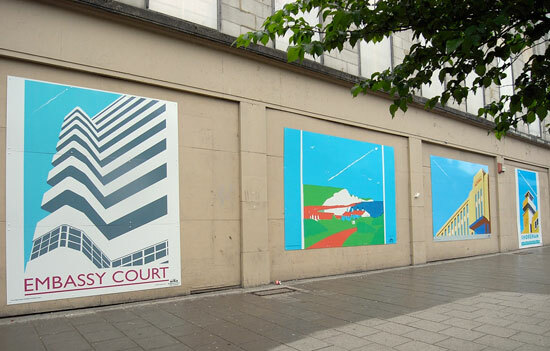 The four are, left to right: Embassy Court (digital print), Seven Sisters (Atonement) (screenprint), Astoria (digital print) and Shoreham Airport (screenprint). Shoreham Airport has had some sky removed to make it fit. None of my original prints were the right shape for the spaces; but I did Astoria especially to fit. The Open Houses are now over until Xmas, so if you want a print, contact me directly. I have one only of Seven Sisters left, and only giclees of the others. All the screenprints of Shoreham Airport have been sold, but there weren’t that many to start off with! The project was commissioned by Matthew Easteal of Environment Improvements, Brighton and Hove City Council, to whom I am extremely grateful for this opportunity. There are some more photos of the erection on Flickr. A brand new giclee print! The art deco Astoria cinema, latterly a bingo hall, on Brighton’s Gloucester Place operated 1933-1977. It’s a sorry sight now, once owned by Stomp it is now the property of Mike Holland who also owns the Engineerium in Hove. The drawing was a bit of a fudge: isometric at the top with a little perspective thrown in down the bottom to make it look right!